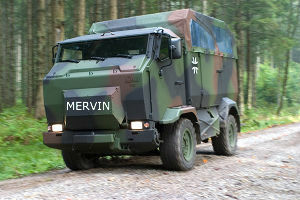 Believing the lawn was simply too soft for the heavy 12-tonne rig, Mervin engaged low-range four-wheel drive. Remarkably, the water pipe held and the rig dug ever deeper, grinding through the couch lawn before coming to rest, probably on the chassis and various fuel and water tanks. In that one moment Mervin made Grey Nomad history, he had bogged the thing on his front lawn and it was now about a half metre lower than the house—hence large mud dollops everywhere! Not one bit daunted, Mervin had a plan—the recovery winch. The winch had a remote control and when he saw the cable still hitched to the water pipe acting as a giant zipper opening the garden he put the chain around something more sturdy—the pine tree. As seen on those off-road 4X4 TV shows, the driver juggles vehicle power and winch via the remote. The onlookers now scattered lest the cable snap and decapitate a spectator or two. All four wheels were slowly turning but the rig moved not. Mervin was visibly distraught as he suddenly appeared in front of the rig with his winch remote—the wheels turning on fast idle with nobody at the wheel. The winch laboured under the load but the truck remained obstinate. Not so with the pine tree. There came a wicked sound of cracking wood and snapping roots and in a split second the tree was ripped free, pitched forward on the rig smashing the solar panels. The wheels still turning to no avail. But Mervin had other fish to fry—his community barbecue later that afternoon. It was soon near 5pm and guests, obviously well versed in neighbourhood freeloading, were arriving with their fold-up chairs and Eskies full of grog. It was time to light the new barbecue. As with most retirees, they eat earlier, reflux, flatulence and that sort of thing you know. Mervin’s raconteur act dragged on and the players were getting hungry. The booze worked its magic. More than an hour downing the rather potent sangria and frosty jugs of home-brewed, extra-strength beer compliments of the host—alcohol content unknown, sorted the novices. Mervin led a surprise chug-a-lug charge which induced a worrisome personality change—bulging eyes and white spittle. But Mervin was a BBQ purist who scoffed at his new, gas barbecue—“it wouldn’t handle the load, not enough heat,” he declared and in a moment, from behind the garage came his 44-gallon drum, cut in half with drooping chicken wire spread across. “It’s better regulated,” he swore—and swear he did, loudly in the ensuing performance, the women now wide-eyed. “Bringing the coals to perfect point is paramount,” lectured the high priest of charcoal while dumping a large bag of briquettes through a hole in the mesh while applying a liberal dose of lighter fluid, which, I suspect was lawnmower fuel with excessive oil in it. Everyone stood watching, wondering what was next. A second soaking and a lit match sent a lethargic flame ambling across the briquettes, crawling up the side of the drum in slow motion and down the outside in fiery drops landing in a puddle beneath. Mesmerised by such oddity, in silence we watched. We collect Chinese art in a humble sort of way mainly because we can exaggerate it’s importance and most are none the wiser. However in studying the style of one of the traditionalists such as Ai Xin Jue Luo Pu Zuo (pronounced Poo Zwa) an interesting comparison arises between the Chinese and Western styles. Whereas the western traditionalist will seek to replicate his subjects form, his Chinese counterpart aims to capture its essence. Intentional or not, Chaucer in this article appears to have exposed the essence of a Prime Minister, namely Malcolm Trumble……….Mervin Trumble is Malcolm to a T.
This is to balance the slurs above about our fearful leader cos I have already slandered him enough in today’s online Australian. The very best BBQ plates in the Galaxy were disguised as storm water drain covers and made from cast steel for the town of Normanton in the Gulf, and for those of you who haven’t been there, Normanton is a bit like Nome Alaska sans ice bergs, bars, saloons, and houses of ill repute, gold too, but the crocs and ‘barra make up for that. The city fathers back in the 1800’s probably didn’t have BBQ plates in mind when they commissioned the manufacture of the drain covers but we enterprising pilots in the 1960’s did and that explains the absence of many of those covers. None of you would believe the very true story about the BBQ I built in Cairns for a mansion I constructed for it entails a run away Fowler Crane, A Diamond T tank recovery vehicle to winch the Fowler back up a hill out of the neighbours banana plantation, an empty swimming pool, poodles dyed pink by a couple down the road who were wired differently, and an ex missus O’H who came from a flash family who even had their chrome plated crowbars made by Wilkinson Sword in the UK. Of course there is a celestial connection, not as in Ming’s (with apologies to RGM) for she had the guild of middle Kingdom assassins association in her employ, and try they did for some years, even going so far as to use a female type one in a comely disguise, but I am still here for the time being. Bots,how about a few yarns once in awhile,should be worth a lough and probably something a bloke could relate to,bit like MERVIN, been there and still enjoy the memory’s and loughs (disasters). BO’H, that sounds like it SERIOUSLY needs telling – maybe MMEd could spike you a slot here soon? The bloke next door gave me detailed instructions on BBQ-ing once just like another bloke gave missus O’H number two or perhaps three (one tends to lose count along with the millions spent given to have them go away) the best and most efficient way to run a fast food joint, catering business, and chocolate shop. I asked her if in this blokes opinion, we were 180 degrees out of whack and when she replied in the affirmative I knew that we were on the right track for sure cause that bloke once went broke in a pub he owned. Now the bloke next door is OK, and after digesting his advice I asked his missus if it were true. She sadly shook her head and told me that he couldn’t even boil water. Dunno what it is about BBQ’s but there are a lot of experts out there and a lot of buggered up tucker. When the Russians kill a beast they yard the poor bloody thing with the aid of wolves, bears, barbed wire flails, and Christ knows what. Having done that they then threaten it with various implements, namely broad axes of varying sizes, and then whack it between the eyes with a hammer so the meat is basically inedible. They hang the poor thing and split it down the middle with a big broad axe and one points at the bit of meat one desires out of the necessity of starvation, a smaller broad axe is produced and the bit hacked off, hooves, hide, grass, crap and all, the whole nine yards. They too have BBQ’s although one suspects that they eat the steel plate on account of it is more tender, tho the missus disagrees. I used to take our beef in from the USA or Oz, big eskies at a time filled with frozen steaks with a few spares for the border Guards.